On 29 April 1907 an agreement was made between William Herbert St Quintin of Scampston Hall, Yorkshire Esquire and 2 builders, Daley and Franklin of 1 Wallingford Avenue and also with the LCC. This was for buildings to be erected behind 61 to 71 St Helens Gardens and a passage way leading to these buildings. The passage way must not be a road and the buildings were not to be used as dwellings but only as stabling for horses or private motor vehicles. Things have changed over the years! 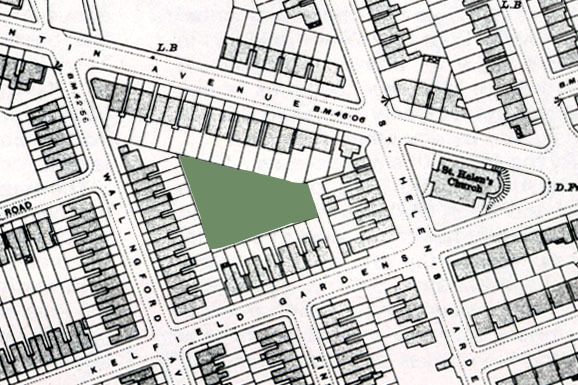 The builders had been granted a 99 year lease on the piece of ground south of St Quintin Avenue, east of Wallingford Avenue and west of St Helens Gardens at a ground rent of £1 per annum from 29 September 1906 paid quarterly. The lease states that it could only be used as an ornamental ground or for lawn tennis or croquet or as a private recreation ground. It must not be used for advertisement or illegal or immoral purpose. In 1908 the builders obtained a licence to build a Pavilion in the ground with the licence renewable every 3 years. The land was leased from the builders for £310 by the Kelfield Lawn Tennis Club Ltd in 1912 The secretary lived at 1 Kingsbridge Road. The ground rent was still only £1p.a. The Land was valued at £330 in 1914. It would appear that many of the Club members were associated with the Wesleyan Church in Lancaster Road and lived in the surrounding roads and the church was renting the ground from the builders by 1922. The Church had collected donations for a War Memorial in memory of those members who had lost their lives in the war and they decided to purchase the ground as the Memorial. 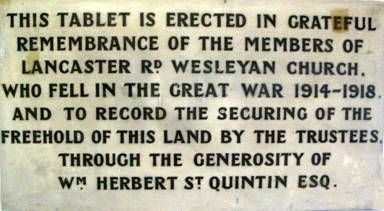 In 1923 Herbert St.Quintin gave the Trustees of the Memorial Fund absolute title to the land for a nominal sum of £20. It was then to be known as the Lancaster Road Wesleyan Church War Memorial Athletic Club. They had to pay the builders a total of £458.14.0. and borrowed £375 from the Midland Bank to do so. The fees for the club at that time were Gentlemen – 30s, Ladies – £1Honorary – 10s. Gentlemen not connected with the Church – £2.2.0 and Ladies – £1.11.6. 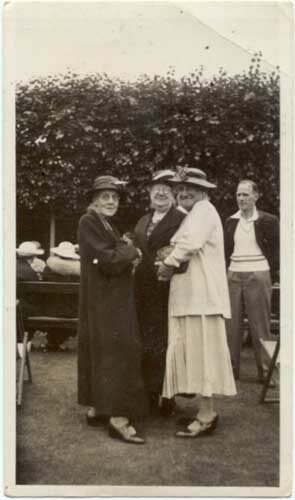 In 1925 it was proposed to place a marble tablet in the pavilion stating why the land had been secured as a freehold property.The first Garden Fete was held in 1933 and was held annually for many years. Audrey Jones and her sister, 1930s. It was suggested that electricity be installed in 1938 but it was agreed that there were too many difficulties and that the gas lighting should be improved. During the 2nd World War, play and other activities continued as often as conditions allowed. Members of the forces were allowed to play for half the visitors’ fees. On 10th May 1941 the pavilion and most of the contents of the kitchen and cloakrooms were badly damaged. In the years following, it was suggested they should buy an Anderson shelter as a tool shed and in 1947 rebuilding the pavilion was proposed. However it took 6 years to get War Damage compensation. In 1949 the club was transferred to the Trustees of the Church and was then run by a managing body. It was then renamed Methodist instead of Wesleyan and so became Lancaster Road Methodist War Memorial Athletic Club. 1951 saw the installation of electricity and in 1954 the first woman became tennis secretary and joined the committee. An Annual Club Supper was held with entertainment and presentation of trophies for Tennis and Bowls Tournaments. Winter activities such as Old Tyme Dancing and Whist Drives raised money for the upkeep of the ground. 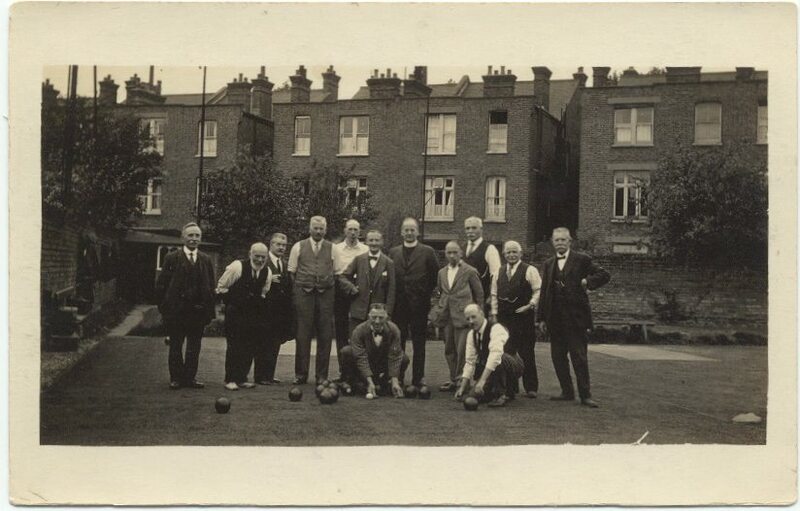 Tennis matches were played against other clubs, such as Hanwell and Surbiton, in a Methodist League and bowls matches against other clubs, including the prisoners in Wormwood Scrubs. During the late 60s it was becoming increasingly difficult to keep the club running. No groundsman could be found and the Church members were finding other outlets for their recreation and the traditional Saturday half-day holiday was no longer the norm and the club ceased to function in 1970. Over the following years new uses were found. A Playgroup was allowed to meet each morning from Monday to Friday. The youth club had cricket nets there for practice. Guides and the Silver Circle group met there at times. Summer play schemes, local children’s parties, firework parties and special church activities all helped to keep the ground as a recreational area. The Playgroup now have a secure tenancy at an agreed fair rent and it was renamed the New Studio Pre-School. In 2010 it achieved a grading of outstanding from OFSTED. The Church still has the use of it at other times as do the local foxes! Written in 2006 by Audrey Jones, revised 2013. Gallery | This entry was posted in St Quintin Park, Uncategorized. Bookmark the permalink. What a lovely article, thank you. Strangly though being born in the house of 69 Walmer Road. Then having lived at 185 Lancaster Rd, from my 2nd birthday and 2 other addresses in Lancaster Road until I moved away in my late 20’s. I have absolutely no idea where this place mentioned actually is? 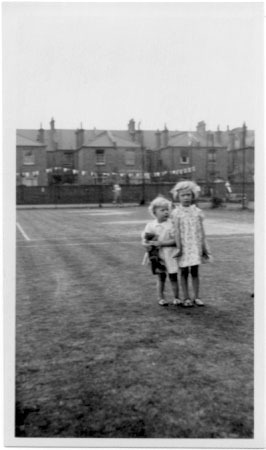 As kids we roamed every inch of our borough and London. You make no clear pointer that I would recognise except St Quintins! The Gardens are approached from the mews that runs off Kelfield Gardens immediately behind the bakery on the parade of shops opposite St Helen’s Church. The houses on St Quintin Avenue(south side), Wallingford Avenue (east side), Kelfield Gardens (north side) and St Helen’s Gardens (west side) are all lucky enough to look directly onto the area. It can only be seen from these houses. This is one of three ‘backlands’ on the St Quintin Estate which have been designated as ‘Local Green Spaces’ within the St Quintin and Woodlands Neighbourhood Plan. This plan was prepared by local residents from 2013-5. At a local referendum in 2016, there was 92% support for the policies and site designations in the neighbourhood plan. Regrettably, the descendants of Hubert St Quintin (the Legard family) chose to challenge the decision of RB Kensington and Chelsea to progress the neighbourhood plan to its referendum. This family had plans to build 21 new townhouses on the land at Nursery Lane, and objected to this site being designated as Local Green Space. This legal challenge was defended by the Council and the St Quintin and Woodlands Neighbourhood Forum. The application from the Legards was dismissed on all grounds. The StQW Neighbourhood Plan was formally adopted by the Council in 2018 and the Local Green Space designation gives the ‘Methodist Church site’ off Kelfield Gardens, the Bowling Club’s land, and the land at Nursery Lane strong protection against any form of development. We believe that Hubert St Quintin would have approved of this outcome.